In 8 quart Dutch oven, heat oil over medium-high heat. Cook celery, onions and garlic until onions are soft. Stir in saffron and achiote until well blended. Add chicken broth, salt and cilantro sprigs; heat to boiling. Reduce heat; simmer uncovered 10 minutes, stirring occasionally. Return to boiling. Discard any broken shell or open (dead) clams that do not close when tapped. Stir clams and cod into broth mixture. Reduce heat. Cover; simmer 4 to 6 minutes or until clams open and fish flakes easily with fork. Stir in shrimp and calamari; simmer until shrimp are pink and calamari are tender about 2 minutes. Stir in crab. Simmer uncovered about 5 minutes or until heated through. Discard any unopened clams. Top each serving with fresh cilantro and lime wedges. Serve with crusty bread to dip into broth, if desired. 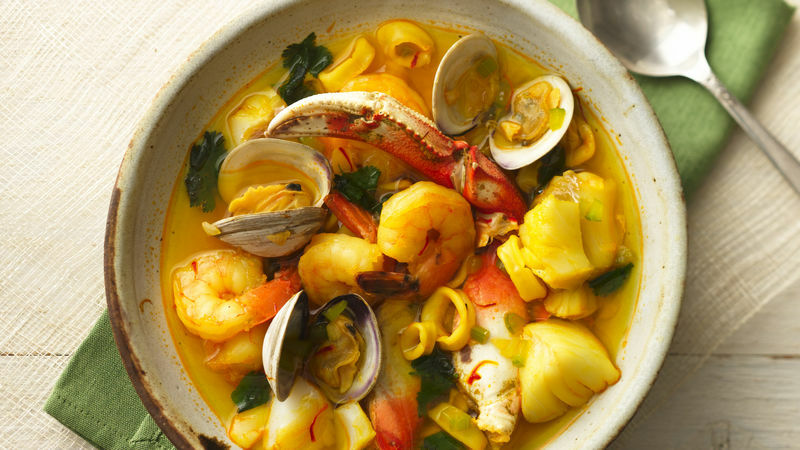 Five types of seafood come together in this hearty seafood stew, providing a wonderful addition to this delicious dish.